It was a sign of things to come. 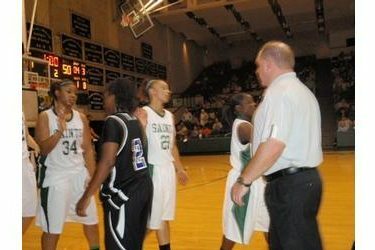 The Lady Saints went the wrong way after the opening tip Saturday night agains Frank Phillips. Head coach Toby Wynn pulled all five starters for the first 10 minutes as the Lady Saints sputtered to a 29-26 halftime lead in route to a 71-50 win over Frank Phillips Saturday night at the Green House. Seward is 7-0 after winning both games of the Billy’s Days Inn Classic over teams from the WJCAC. Seward shot 50 percent in the second half after shooting just 32 percent in the first half. SCCC was 5-11 from three-point range in the second half. The Lady Saints forced just 13 Lady Plainsmen turnovers. Frank Phillips (4-4) shot just 27 percent from the field. Mariah Lee led Seward with 15 points and 10 rebounds. Anete Kirsteine added 13 including 3-4 from three-point range. She added four assists. Elkhart’s Payton Flemming had 12 points and 10 rebounds. Maddie Yanke scored 10 and grabbed nine rebounds. The Lady Saints play Friday and Saturday at 1:30 in Garden City against Independence and New Mexico Junior College. Friday’s game airs on Talkradio 1270 and Saturday’s game is on B107.5.